BELIZE CITY, Thurs. July 7, 2016–Two men were ruthlessly executed on the city’s northside and southside within an hour of each other. Neighbors counted six shots during the tragic shooting of Tevin “Chi Cha” Palmer, 20. According to police, shortly after 3 p.m. yesterday, four men — two on racerbikes and two on beach cruisers — made their way from New Road onto Castle Street. The men then entered #50 B Castle Street, fired several shots at Palmer and then fled the scene. Fortunately, while several persons were inside the home and yard, including children, only Palmer was injured. Palmer, an unemployed visitor to the home who was seated in a couch in the living room, was shot several times and died instantly. Superintendent Hilberto Romero told Amandala that the victim knew his attackers. According to police information, Palmer and the men believed to have killed him had frequented that home daily. Palmer had usually visited a female friend, who is the niece of the homeowner. His alleged killers had also been closely related to the homeowner, who was not at home when the incident transpired. Police told Amandala that Palmer’s killers were connected to the Ghost Town Gang. However, Palmer was connected to their George Street rivals. Almost an hour after Tevin Palmer’s demise, Devin “Eggy” Parham, 19, was gunned down in broad daylight on the heavily trafficked Cemetery Road in front of Habet and Habet. A close relative had called Parham immediately following Palmer’s death and warned him to go home. According to police reports, Parham, unemployed, was with his cousin and they were making their way home to Currasow Street from Dolphin Street and then onto Cemetery Road when a shooter opened fire behind them. Relatives of the deceased told Amandala that Parham and his cousin attempted to flee, but Parham was tripped by his trousers, which were hanging too low. Neighbors counted nine shots in the course of the shooting. Parham died on the spot where he had collapsed. A senior police officer told Amandala that both Palmer and Parham were initially connected to the George Street Gang (Gaza). According to him, Palmer was recruited under the stewardship of a Gaza member, Brandon “BT” Tillett, who was almost slain in front of the Queen Street police Station on June 17 after he had exited the station’s premises following his weekly signing in. Parham, a resident of Curassow Street, from where the 123rd Bloods lead their operations, had too been a soldier for Gaza. However, the relationship between Gaza and the 123rd gang was severed after Mark Medina was slain in April of last year. Police told Amandala that Palmer’s death may have been connected to the death of Giovanni “Blege” Gentle, who was slain over the weekend. Police revealed to us that Giovanni Gentle, who was murdered, allegedly in Gaza territory over the weekend, was a cousin of one of Ghost Town’s most influential personalities. However, Chi Cha Palmer had not been listed as a murder suspect by police. Immediately following Palmer’s death, police detained one man for questioning. Almost two years ago, Palmer’s older brother, Gerald Palmer, 27, was fatally shot multiple times in Grant’s Alley during a blackout. ”Chi Cha” Palmer, on the other hand, had been remanded for the attempted murder of Sean Fisher, 21, who had been shot in the abdomen and buttocks while on Dean Street in July 2014. He later obtained bail. In the case of the death of Parham, another Gaza member with residence in North Creek, believed to be in his early 20s, was detained as he made his way from Plues Street into South Street. He was allegedly found with a 9mm gun in his possession. ACP Williams told Amandala that today, a man whose age was not provided, was charged with Parham’s murder. He has not been taken before the court as yet, however. Yesterday, police had detained two persons, one 19 and the other a male minor, both believed to be associates of the Ghost Town Gang. They were scooped up from a group of onlookers at the crime scene. However, formal charges have not been brought against them by police as yet. 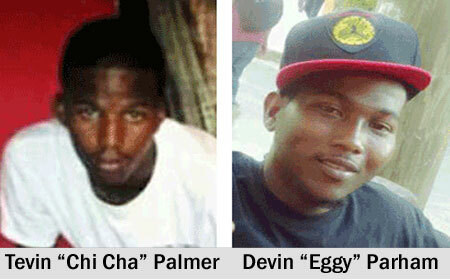 While the now deceased Devin “Eggy” Parham had survived an attack on his life back in March 2014, in January of that same year his older brother, Derrick “Beng” Parham, 25, was shot to death. According to police information, more bodies may fall in retaliation.